Tonya Pinkins and Dianne Wiest in Rasheeda Speaking . Photo by Monique Carboni. BOTTOM LINE: Racial tensions and power struggles develop when a doctor enlists the help of one of his office employees to terminate another in this comical character study. A few months ago, New York Times critic Alessandra Stanley caused quite a stir when, in her article about screenwriter/director/producer Shonda Rhimes (Grey’s Anatomy, Scandal), she implied that Rhimes is an “angry black woman.” Interviews with Rhimes and articles by her friends and supporters soon followed, the latter mostly defending Rhimes as a multi-talented and multi-faceted individual. The theme of the “angry black woman” gets revisited and re-imagined in Joel Drake Johnson’s Rasheeda Speaking, an entertaining and poignant new production by The New Group. Except in this treatise, the “angry black woman” is left to fend for herself. No one jumps to her aid, and there’s no need. Jaclyn (Tonya Pinkins), the feisty and scrappy woman in question, does quite a good job of handling her own affairs and making the audience laugh and think to boot. Jaclyn’s reputation literally precedes her during Rasheeda Speaking’s opening sequences. The most recent administrative hire at Dr. Williams’ (Darren Goldstein) office, Jaclyn is first introduced through a gossip exchange between her boss and Ilene (Dianne Wiest), the senior hire that was just promoted to office manager. Through Johnson’s cleverly written and carefully veiled dialogue, the cheeky and slippery Dr. Williams schmoozes sweet and eager-to-please Ilene into agreeing to spy and snitch on Jaclyn so that he can gather enough ammunition to get Jaclyn fired. According to the good doctor, Jaclyn seems “unhappy”, “mad at the world,” and just doesn’t appear to “fit in.” Complimentary to Jaclyn at first, Ilene reluctantly takes on her new responsibilities. Coming off a five day leave because of the “toxins” in the office, Jaclyn walks in and one can’t help but start to look for confirmations of what the good doctor was talking about. “Is she going to lash out now?” or “watch out!” seem to be the phrases that are pregnant in the audience’s minds. Jaclyn is a little sharp and short, making the already on-edge Ilene a little uneasy, but she doesn’t exhibit anything crazy yet. Surveying Allen Moyer’s authentic and appropriately messy set, it appears that Jaclyn has every right to be taken aback when she finds that her plants have wilted and that piles of junk have been strewn on her desk. And so what if she doesn’t have on standard business attire? With Ilene’s short skirt and clogs, it’s hard to find fault with Jaclyn’s office wear. You almost feel sorry for Ilene because she tries too hard. At least Jaclyn dresses her age and isn’t trying to impress anyone, right? Despite once getting along, the differences between these two office mates are many. One black, one white. One bold, one mousy. One racist, and one….oh, wait? Which one is the racist one? Part of the fun, as well as the substance, of Rasheeda Speaking is figuring that out. Is it Jaclyn, who has all kinds of things to say about the whites, the Mexicans, and the people who blow themselves up, or is it Ilene, who seems benevolent but may have her own prejudices simmering underneath? 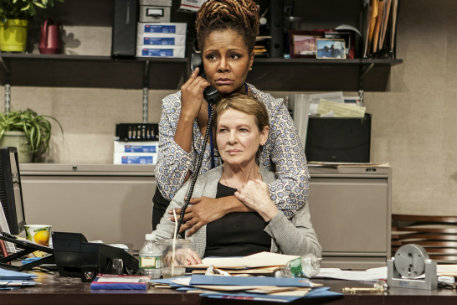 Is it Dr. Williams, who clearly wants to be rid of Jaclyn and feels uncomfortable around her, or is it Rose (Patricia Conolly), the kindly patient who seems to repeatedly upset Jaclyn, first with her forgetfulness and then with her antiquated ideas about slavery? Take your pick in this fast-paced dramedy that pokes at gray areas and, in many ways, rings true about pre-conceived notions and ideas. A few things that don’t ring true are some of the character specifics. For instance, even though Jaclyn pulls out a Bible moments before she questions Ilene’s integrity, she never once alludes to her Catholic faith. Yet she sports a framed photograph of the Virgin Mary on her desk and walks around with a rosary wrapped around her hand. The visuals just don’t add up with the story. (And if stereotypes were the aim, a Pentecostal or Evangelical Christian background might be more apropos.) However, the inclusion of religion at all seems unnecessary in context with everything else. Another example is a shared, tender moment between Jaclyn and Ilene. During a scene in which it appears that both have lowered their guards, the two ladies embrace and touch noses in a sweet way that doesn’t suit their relationship. Even if they were friendly before, their six-month acquaintanceship probably wouldn't have extended that far, nor does the script support this kind of affection. This encounter slightly mars what is otherwise Cynthia Nixon’s very successful and skillful directorial debut. Finally, Rasheeda Speaking could easily be shortened by one scene. Dragging past what could have been its natural ending, Johnson adds one more scene at the conclusion that, if dropped, would provide much better emphasis and impact. But barring a few hiccups, Rasheeda Speaking is a good exposition on race and power, not to mention a great display of acting prowess. Tonally, it mixes light and dark well (pardon the pun), and is always intriguing to watch. Rasheeda is not only speaking, but through this play, she makes sure that her voice is heard.